This protocol describes how to generate a Drosophila S2 cell line that is sensitive to small molecule inhibitors of kinesin-5. The use of these cells in a cell-based error correction assay is also outlined. Ye, A. A., Maresca, T. J. Generating a "Humanized" Drosophila S2 Cell Line Sensitive to Pharmacological Inhibition of Kinesin-5. J. Vis. Exp. (107), e53594, doi:10.3791/53594 (2016). Kinetochores are large protein-based structures that assemble on centromeres during cell division and link chromosomes to spindle microtubules. Proper distribution of the genetic material requires that sister kinetochores on every chromosome become bioriented by attaching to microtubules from opposite spindle poles before progressing into anaphase. However, erroneous, non-bioriented attachment states are common and cellular pathways exist to both detect and correct such attachments during cell division. The process by which improper kinetochore-microtubule interactions are destabilized is referred to as error correction. To study error correction in living cells, incorrect attachments are purposely generated via chemical inhibition of kinesin-5 motor, which leads to monopolar spindle assembly, and the transition from mal-orientation to biorientation is observed following drug washout. The large number of chromosomes in many model tissue culture cell types poses a challenge in observing individual error correction events. Drosophila S2 cells are better subjects for such studies as they possess as few as 4 pairs of chromosomes. However, small molecule kinesin-5 inhibitors are ineffective against Drosophila kinesin-5 (Klp61F). Here we describe how to build a Drosophila cell line that effectively replaces Klp61F with human kinesin-5, which renders the cells sensitive to pharmacological inhibition of the motor and suitable for use in the cell-based error correction assay. Equal segregation of the genome during cell division requires correct interactions between the replicated DNA and spindle microtubules. Microtubules physically interact with chromosomes through an ensemble of proteins that assembles at centromeres known as the kinetochore1. Correct distribution of the chromosomes requires that sister kinetochores are bioriented, in which each sister is associated with microtubules originating from opposite spindle poles. Kinetochore microtubule (kt-MT) attachments that are not in the bioriented conformation are quickly and efficiently destabilized to provide the opportunity to establish biorientation in a process known as error correction. An error correction assay that was previously established in mammalian cells5 requires assembling monopolar spindles using reversible small molecule inhibitors against Eg5 (kinesin-5). The drug treatment generates a multitude of erroneous syntelic attachments in which both sister kinetochores attach to the same spindle pole. A subsequent washout of the drug allows for visualization of the error correction process. The error correction assay can be done in the presence of small molecule inhibitors or knockdowns to study the contribution of candidate proteins to correcting erroneous kt-MT attachments. The ability to visualize error correction in living cells is a powerful tool to further understand the molecular mechanism involved in this complex process. However, the large number of chromosomes present in most cell lines poses a challenge in observing individual kt-MT attachments. Drosophila S2 cells would be ideal for applying the error correction assay as they contain as few as 4 chromosomes6, but small molecule inhibitors of kinesin 5 such as S-trityl-L-cysteine (STLC) and monastrol7-9 do not affect spindle assembly or kinesin-5 motor function in Drosophila cells. We therefore generated a Drosophila S2 cell line expressing human kinesin-5 under an inducible promoter that is sensitive to kinesin-5 inhibitors. This protocol describes how to knockdown the endogenous Drosophila kinesin-5 homologue, Klp61F, and use this cell line in the cell-based error correction assay. From a previously cultured 25 cm2 flask, add GFP-α-tubulin-expressing S2 cells10 to a final volume of 2 ml at 100% confluency, and allow them to semi-adhere to the bottom of a 35 mm tissue culture dish for approximately 1 hr. Remove the media from the dish. Transfect 2 µg of the Eg5-mCherry construct11 with 1 ml of Schneider's media supplemented with 10% FBS (referred to hereafter as Schneider's media) and Transfection Reagent, following the manufacturer's protocol. Seal the dish with Parafilm and incubate cells at 25 °C for 16-18 hr. Add 1 ml of Schneider's media. Return cells to 25 °C incubator. On day 3 post-transfection, transfer 500 µl of transfected cells into a new 35 mm tissue culture dish containing 1.5 ml of Schneider's media for a test induction. Induce the expression of Eg5-mCherry by adding CuSO4 to a final concentration of 500 µM. Seal the dish in Parafilm and incubate at 25 °C O/N. To make concanavalin A-coated coverslips, pipette enough volume of concanavalin A solution (0.5 mg/ml dissolved in H2O) to coat an acid washed coverslip, remove the excess, and allow the coverslip to air dry. Place a 22 mm x 22 mm concanavalin A-coated coverslip in a clean 35 mm tissue culture dish, then seed 500 µl at 100% confluency of the induced cells onto the coverslip and allow the cells to adhere for 1 hr at RT. To check for Eg5-mCherry expression, assemble the coverslip into a rose chamber (or appropriate imaging vessel) with media for imaging at RT on a fluorescence microscope. Use appropriate light sources and filter sets to visualize the cells. For example, the microscope used in this study has an LED white light source and EGFP (FITC/Cy2) and DSRed (TRITC/Cy3) filter cubes. Eg5-mCherry localizes to microtubules and is enriched near spindle poles. After ensuring that the cells are expressing both Eg5-mCherry and GFP-α-tubulin, transfer the remainder of the transfected, uninduced cells to a 25 cm2 tissue culture flask containing 4 ml of Schneider's media. Add Blasticidin S HCL at a final concentration of 25 μg/ml to the flask of transfected cells and continue splitting in the presence of 25 μg/ml Blasticidin S HCl until cell death ceases being sure to check for expression of Eg5-mCherry periodically. Incubate cell lines in 25 °C incubator. NOTE: The percentage of cells expressing Eg5-mCherry increases over time. Once cells are stably transfected, continue to split in the absence of drug and freeze12 cells for future use. PCR amplify a ~500 bp region of Klp61F from cDNA (LD15641) using primer with added T7 promoter sequence (sequence provided in Materials List) to be used as a template for dsRNA synthesis. Set up four PCR reactions, 50 µl each, containing 100 ng of template DNA, 25 µM of each primer, appropriate buffer, and polymerase. Set the PCR protocol on the thermocycler according to the polymerase's manufacturer's protocol. Pool and clean four PCR reactions using a PCR clean up kit according to manufacturer's protocol. Store the clean template at -20 °C. Prepare double stranded RNA (dsRNA) from template using a T7 RNA transcription kit, following the manufacturer's instructions. Expect ~5-15 mg/ml concentration of dsRNA. Store dsRNA at -20 °C. To Knockdown Klp61F with dsRNA, allow S2 cells expressing Eg5-mCherry at 25% confluency to semi-adhere to the bottom of a 35 mm tissue culture dish for 1 hr. Remove the media from the dishes and add 5 µg of dsRNA against Klp61F (Drosophila kinesin-5) diluted into 1 ml of serum-free Schneider's media. Incubate at RT for 1 hr, then add 1 ml of Schneider's media with 10% FBS. Incubate cells at 25 °C. 24 hr after dsRNA treatment, induce expression of Eg5-mCherry by adding CuSO4 to a final concentration of 500 µM. Incubate cells at 25 °C for another 24 hr. Place a 22 mm x 22 mm concanavalin A coated coverslip into a clean 35 mm tissue culture dish. Seed 500 µl of the cells that have been treated with dsRNA and induced O/N onto the concanavalin A coated coverslip and allow them to adhere for about 1 hr. Assemble the coverslip into a rose chamber (or appropriate vessel) for imaging. Find mitotic cells expressing both Eg5-mCherry and GFP-α-tubulin. NOTE: Mitotic cells expressing only GFP-α-tubulin should have monopolar spindles since Klp61F, which is required for spindle bipolarity, is knocked down10,13. Collect time-lapse images of bipolar spindles (e.g., 1 frame per minute) in cells expressing both Eg5-mCherry and GFP-α-tubulin. While imaging, remove the media from the rose chamber, and replace it with Schneider's media containing 1 µM STLC over 3 consecutive media exchanges (~5 ml total) into the chamber to visualize spindle collapse. To washout the drug and reverse the spindle collapse, carefully remove the STLC-containing media from the rose chamber, and wash in Schneider's media 4x (6-8 ml total) before refilling the rose chamber one last time with fresh media. Continue imaging. Place a 22 mm x 22 mm concanavalin A coated coverslips into clean 35 mm tissue culture dishes. Seed 500 µl of cells that have been treated with Klp61F dsRNA onto the concanavalin A coated coverslip and allow them to adhere. After cells are adhered, add 1.5 ml of Schneider's media to each dish to bring the final volume up to 2 ml. To arrest cells in mitosis, add MG132 to a final concentration of 10 µM to each of the dishes, and incubate for 1 hr. Add 1 µM STLC and incubate for 1 hr to allow monopoles to form. Wash out the STLC by rinsing coverslips 3x with 2 ml of fresh Schneider's media each time. Incubate coverslips with Schneider's media in addition to any pharmacological drugs (e.g., Aurora kinase inhibitors) or DMSO as a control. Note: Inhibitor concentrations vary and proper final concentrations must be determined by the experimenter. Stock solutions are typically made such that the inhibitor is diluted 1:1,000 into media. In this case a 1:1,000 dilution of DMSO (or appropriate solvent) serves as the vehicle control. We use the Aurora B inhibitor Binucleine 2 at a final concentration of 40 µM. Quickly rinse the coverslips with 2 ml of 1x BRB-80. Fix cells by adding 2 ml of 10% paraformaldehyde diluted in 1x BRB-80 for 10 min. Pipet paraformaldehyde carefully in a chemical hood. Permeabilize cells with 2 ml of 1x PBS + 1% Triton-X for 8 min. Wash slides 3x with 2 ml of 1x PBS + 0.1% Triton-X. Transfer coverslips cell-side face up onto a sheet of Parafilm (use a marker to label Parafilm appropriately to keep track of the slides) in a 150 mm Petri dish. Cover the coverslips with 150 µl boiled donkey serum (BDS) and incubate at RT for 1 hr to block non-specific antibody binding. Note: Here, the fixation protocol can be stopped to be continued at a later point. Coverslips can be stored in a moisture chamber at 4 °C for up to 24 hr. To make the moisture chamber, line the rim of a 150 mm dish with a wet laboratory wipe and cover with the Petri dish lid. Remove block, and incubate the coverslips for 1 hr at RT with 150 µl of primary antibodies diluted appropriately in BDS to stain for kinetochores and microtubules to final concentrations of 2 µg/ml (or according to manufacturer's recommendations) and 1 µg/ml, respectively. Note: Here, the fixation protocol can be stopped to be continued at a later point. Coverslips can be stored in a moisture chamber at 4 °C for up to 24 hr. Wash coverslips 3x with 500 µl of 1x PBS + 0.1% Triton-X. Incubate coverslips for 30-60 min at RT with the appropriate fluorophore-conjugated secondary antibodies diluted in BDS. Incubate coverslips with 150 µl of BDS containing 1 µg/ml DAPI final concentration for 5 min. Wash coverslips 2x with 1x PBS + 0.1% Triton-X, and mount coverslips cell side down on a 3x1" slide with 8 µl of mounting media. Paint the corners with nail polish to immobilize the coverslips onto slides. Image cells with bipolar spindles that are expressing Eg5-mCherry. Take a Z series consisting of 30 planes at 0.2 µm intervals in all channels using a 100X objective. Carefully analyze the kinetochores and microtubules to determine the attachment states (bioriented or syntelic attachments). Klp61F is required to form bipolar spindles. The human kinesin-5, Eg5, can rescue the function of Klp61F in Drosophila S2 cells (Figure 1A and D). Upon addition of the kinesin-5 inhibitor (STLC), microtubule-associated levels of the motor drop (Figure 1B and E), and the spindle collapses, resulting in a monopole (Figure 1C and F) in cells lacking endogenous Klp61F upon successful RNAi (Supplemental movie 1). It is noteworthy that bipolar spindles collapse upon addition of STLC in the humanized S2 cells because kinesin-5 activity is not required to maintain spindle bipolarity in human cells. This interesting discrepancy may be a result of differences in interpolar microtubule overlap and/or stability in the two model systems14. Kinesin-5 inhibition (Figure 2A and E) can be reversed by washing out the drug and recovery of a bipolar spindle can be followed over time. Upon removal of the inhibitor (Figure 2B and F), Eg5-mCherry re-associates with the microtubules as a bipolar spindle assembles (Figure 2C and G), and cells can progress into a bipolar anaphase (Figure 2D and H, Supplemental movie 2). Figure 1. 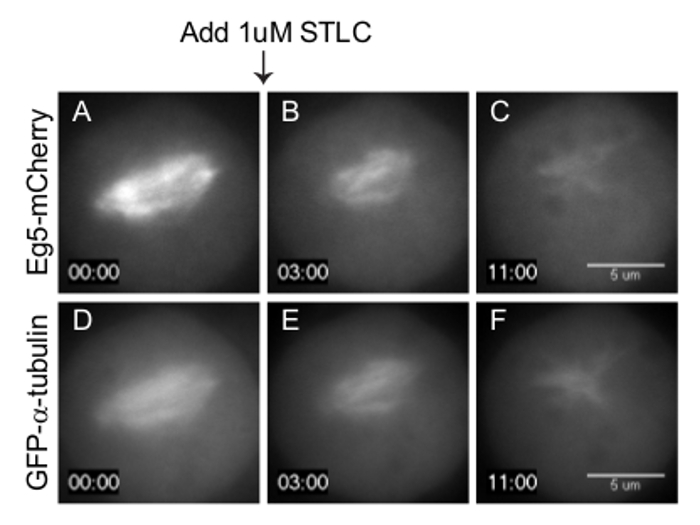 Addition of 1 µM STLC leads to monopolar spindles in Drosophila S2 cells. Representative images from time-lapse imaging of a Drosophila S2 cell expressing Eg5-mCherry (A-C) and GFP-α-tubulin (D-F) during addition of 1 µM STLC. The Eg5 inhibitor was added at 3 min. Scale bar = 5 µm. Timestamp = min:sec. Please click here to view a larger version of this figure. Figure 2. A bipolar spindle reforms upon removal of STLC. 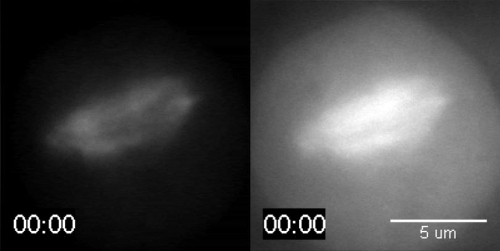 Representative images from time-lapse imaging of a Drosophila 2 cell expressing Eg5-mCherry (A-D) and GFP-α-tubulin (E-H) during an STLC washout experiment. STLC was washed out at 5 min. A bipolar spindle reforms within 1 hr of removing the STLC. Scale bar = 5 µm. Timestamp: min:sec. Please click here to view a larger version of this figure. Supplemental Movie 1. (Right click to download). Widefield fluorescence imaging of a representative example of a Drosophila S2 cell expressing Eg5-mCherry (left) and GFP-α-tubulin (right). 1 µM STLC was added at 2 min, and the spindle forms a monopole within 10 min after addition of the inhibitor. Images were acquired every 1 min and played at a rate of 10 frames per second. Scale bar = 5 µm. Supplemental Movie 2. (Right click to download). Widefield fluorescence imaging of a representative example of a Drosophila S2 cell expressing Eg5-mCherry (left) and GFP-α-tubulin (right). Media containing 1 µM STLC was removed and rinsed at 5 min. A bipolar spindle reforms within 1 hr of removing the inhibitor. Images were acquired every 1 min and played at a rate of 10 frames per second. Scale bar = 5 µm. Visualizing error correction is a valuable technique to study the steps involved in this important and complex cellular process. To do so, erroneous attachments are generated using reversible inhibitors, and error correction is observed upon washout of the drug. This assay was originally developed using mammalian tissue culture cells5. However the presence of large number of kinetochores in many model mammalian cell types poses a challenge in observing individual error correction events. Drosophila S2 cells possess as few as 4 pairs of kinetochores, making them a more preferable cell line for observing error correction. However, a major drawback is that many inhibitors are ineffective in Drosophila S2 cells. Thus, the ability to generate a humanized Drosophila S2 cell line expressing human kinesin-5 provides a valuable tool to study error correction. Although Drosophila S2 cells can be a better cell line to study error correction, the multiple steps involved in obtaining the cell line and knocking down essential genes poses some challenges to this technique. For instance, transfection efficiency can be quite low. If less than 20% of the cells are expressing the Eg5-mCherry, the transfection should be repeated as the selection process will take longer. Also, the percentage of cells expressing both fluorescent proteins may decrease over time. This can be overcome by splitting cells in the presence of Blasticidin S HCl and Hygromycin B to select for cells expressing Eg5-mCherry and GFP-α-tubulin, respectively. It is also important to note that Drosophila S2 cells have orthologues to many human proteins and; therefore, it is critical to optimize the knockdown conditions for the endogenous proteins. Optimal knockdown conditions may vary in the amount of dsRNA and the length of treatment. Considering the emergence and rapid improvement of CRISPR-Cas9 technologies15-17, generation of a Drosophila cell line with the Klp61F gene replaced by human Eg5 presents a powerful alternative that would overcome the limitations of the transfection and knockdown approach. Our work demonstrates that fly-to-human gene replacement should be a viable option in this case although the necessary reagents to do so in Drosophila S2 cells are currently being developed. This procedure is not limited to Eg5, but can be applied to study the function of other proteins of interest. If using inhibitors that have previously been established to be ineffective in Drosophila S2 cells, this protocol can be modified to study the direct effect of inhibitors in live cells without concerns about off target effects. The cell line produced using this protocol could also be used in high-throughput screening analyses to identify potential drugs targeting proteins involved in error correction. We would like to thank Patricia Wadsworth for the gift of the kinesin-5 construct. This work was supported by an NIH grant (5 R01 GM107026) to T.J.M. and by Research Grant No. 5-FY13-205 from the March of Dimes Foundation to T.J.M., as well as support from the Charles H. Hood Foundation, Inc., Boston, MA. to T.J.M. Concanavalin A Sigma C5275 0.5 mg/ml solution made by dissolving in 1x PBS. Boiled Donkey Serum Jackson ImmunoResearch Labs 017-000-121 5% stock solution in 1x PHEM buffer, bring solution up to boil. Stored in 4 °C. Mounting Media 20 mM Tris pH 8.0, 0.5% N-propyl gallate, 90% Glycerol. Stored in 4 °C. Cheeseman, I. M., Desai, A. Molecular architecture of the kinetochore-microtubule interface. Nat Rev Mol Cell Biol. 9, 33-46 (2008). Maresca, T. J., Salmon, E. D. Welcome to a new kind of tension: translating kinetochore mechanics into a wait-anaphase signal. J Cell Sci. 123, 825-835 (2010). Kitajima, T. S., Ohsugi, M., Ellenberg, J. Complete kinetochore tracking reveals error-prone homologous chromosome biorientation in mammalian oocytes. Cell. 146, 568-581 (2011). Cimini, D., Wan, X., Hirel, C. B., Salmon, E. D. Aurora kinase promotes turnover of kinetochore microtubules to reduce chromosome segregation errors. Curr Biol. 16, 1711-1718 (2006). Lampson, M. A., Renduchitala, K., Khodjakov, A., Kapoor, T. M. Correcting improper chromosome-spindle attachments during cell division. Nat Cell Biol. 6, 232-237 (2004). Learman, S. S., et al. NSC 622124 inhibits human Eg5 and other kinesins via interaction with the conserved microtubule-binding site. Biochemistry. 48, 1754-1762 (2009). Liu, L., Parameswaran, S., Liu, J., Kim, S., Wojcik, E. J. Loop 5-directed compounds inhibit chimeric kinesin-5 motors: implications for conserved allosteric mechanisms. J Biol Chem. 286, 6201-6210 (2011). Maliga, Z., Mitchison, T. J. Small-molecule and mutational analysis of allosteric Eg5 inhibition by monastrol. BMC Chem Biol. 6, 2 (2006). Goshima, G., Vale, R. D. The roles of microtubule-based motor proteins in mitosis: comprehensive RNAi analysis in the Drosophila S2 cell line. J Cell Biol. 162, 1003-1016 (2003). Salemi, J. D., McGilvray, P. T., Maresca, T. J. Development of a Drosophila cell-based error correction assay. Front Oncol. 3, 187 (2013). Sharp, D. J., Yu, K. R., Sisson, J. C., Sullivan, W., Scholey, J. M. Antagonistic microtubule-sliding motors position mitotic centrosomes in Drosophila early embryos. Nat Cell Biol. 1, 51-54 (1999). Kollu, S., Bakhoum, S. F., Compton, D. A. Interplay of microtubule dynamics and sliding during bipolar spindle formation in mammalian cells. Curr Biol. 19, 2108-2113 (2009). Doudna, J. A., Charpentier, E. Genome editing. The new frontier of genome engineering with CRISPR-Cas9. Science. 346, 1258096 (2014). Hsu, P. D., Lander, E. S., Zhang, F. Development and applications of CRISPR-Cas9 for genome engineering. Cell. 157, 1262-1278 (2014). Mali, P., Esvelt, K. M., Church, G. M. Cas9 as a versatile tool for engineering biology. Nat Methods. 10, 957-963 (2013).